Need a tried and tested bread roll recipe? 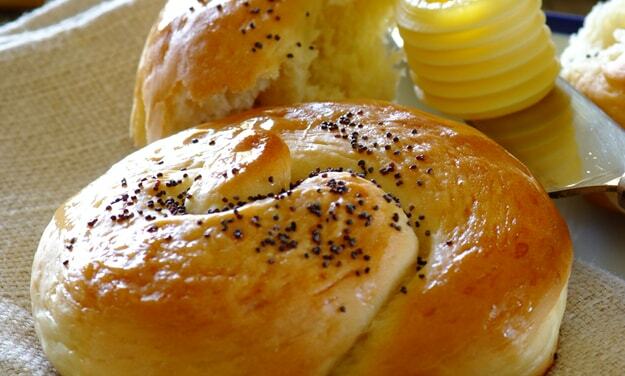 Try this simple recipe for delicious bread rolls that will have the whole dinner table smiling. Stork – Love to Bake. Mix the yeast mixture ingredients together in a bowl; sprinkle a little flour on top and leave to froth. In another bowl mix together all the dry ingredients. Add the yeast mixture to the dry ingredients and stir with a wooden spoon. Turn onto a floured surface and knead for 5 minutes. The dough should be soft but not sticky. If too sticky, add more flour. Place the dough in an oiled bowl (rubbed with cooking oil), cover with plastic wrap and a cloth and leave in a warm place to rise until it is double in size. Place on a floured surface, knock back and knead lightly. Shape the dough into one loaf or divide it into 12 equal amounts. Roll each piece into a long sausage shape, loosely tie a knot, place on a greased oven tray and allow it to double in size. Bake for approximately 15 minutes in a preheated oven at 150°C - 180°C until golden brown. TIP: When you tap the bottom it should sound hollow.